Click below to go where you want to go. You are welcome to come in and out of the festival gates throughout the weekend. Just make sure you keep your wristband on. Please follow this link to get your wristband refund. Funds are available up to 4 weeks after the event. Festival One is multi-day Christian Festival held at Mystery Creek, Hamilton on Auckland & Waikato Anniversary Weekend. Festival One is in its fourth year and has a broad range of fantastic artists, lots of opportunities for the creative arts and a few other surprises. Our goal is to create community in the church through music, art and culture. This will be achieved through organic growth, an annually progressing teaching curriculum and outstanding music and arts. Love festival? Love the people? Love & appreciate the work that goes into it? Then join the team. Email info@festival.one to find out more. The Ministry of Art is a sweet space for visual artists to share their work at Festival One – painting, photography, sculpture, drawing – the options are pretty much endless. Applications will be open for 2020 later this year. We welcome your agency to come be part of Festival 2020. Applications will be available later this year. If you want to find out more email missions@festival.one. Sign up to the mailing list to get the goss on Festival news. Click this link for the printable version of the Festival Programme! Please note: We recommend you use the Festival APP for the most current version as there are still some changes to come on the printable versions. Our goal is to make your experience getting onto and around site as easy as possible. 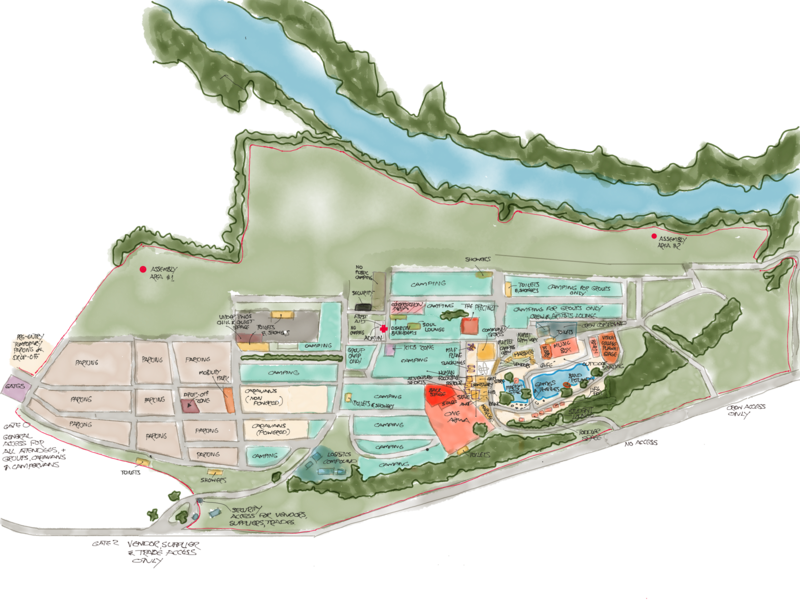 Click this link to view the latest version of the site map. Over the years we’ve had some amazing food and retail vendors colour festival. For 2020 we’d love to hear from you about what vendors you want to see! They all grow up so fast! Are your young’uns ready to fly the nest (temporarily, under supervision, in a super-fun and safe space)? We’ve got you covered. Head to the New Realease building, sign posted KIDS PROGRAMME. For your small ones (5 – 10-year-olds) available Saturday, Sunday and Monday. All of Festival One’s little humans will have a space to have the time of their lives AND learn about God’s awesome love—which is pretty much the same thing. The Toddlers’ Creche, for ages 2 – 4 years, will be your good ol’ drop-and-go space, held in its own building, the Historic Garage! Crew available in the space on Saturday, Sunday and Monday from 9am – 12pm. Parents will need to provide a water bottle. We’ll have a light morning tea of fruit for your precious, butter-fingered toddlers. Parents, you’ll need to stay on call in case your child needs you – especially for those nappy changes! If nappies need changing, we’ll flick you a text. You can pre-register from 3 – 4:50pm on Friday night in Historic Garage or the walk-up registration is open from 8:30 – 9am on the day. Spaces are limited, so please be punctual! As we come together as the body of Christ, we’re called to be One whanau. For this years film comp, we want you to show us what whanaungatanga looks like at Festival. Capture community, film family, and showcase your siblings in Christ. Record, edit and upload your 1 minute long film to Instagram using the hashtag #F1FilmComp2019 and #Under16 or #Over16 so we know what age category you’re in, and remember for us to see your video, your Instagram must be on public. Entries close 3pm Sunday 27th Jan.
Our panel of judges will review the videos and award some pretty amazing prizes to the winners. What is it like when the character of God, the God of the Bible, is fully present? It means a lot more than just peace. It is a whole series of apparent contradictions. It’s super fun playing with these apparent contradictions – fast & slow, moving & stopped, light & dark, rest & work, and so on. How can you bring these to life, in your own unique way? Get creative and get snapping! Cash prizes to be won. Simply snap your picture and upload it to Instagram using the hashtag #F1PhotoComp2019 and #Under16 or #Over16 so we know what age category you’re in, and remember for us to see your picture, your Instagram must be on public. Entries close 3pm Sunday 27th Jan.
Are there rules? Where do I find them? Easy. We call it a Code of Conduct and if we all live by it, everyone will have a sweet time at Festival One. What about Camping & Caravans? Can I bring my caravan or book a powered site? You sure can! All pricing for powered sites and caravans will be available on iTICKET later in the year. There are toilets (not port-a-loos, you’re welcome), showers and disability-friendly facilities located all over the grounds. You’ll be able to see these on our map soon. Is there drinkable water on site? Water is available everywhere on-site. It is clean and drinkable, so unless you only drink bottled water – no judgment here, friend – you won’t have to worry about buying it. How can I get early access on Thursday night to setup? If you have a large group (100+) you will be issued temporary vehicle access for 4 representatives of your group to bring in gear at 6pm on Thursday night. The representatives must have had their wristbands sent to them prior to arriving at the festival. Email groups@festival.one before the 6th of December 2019 to arrange this. My church has given me a different code, what’s that about? Your church already has a Festival One ambassador! Some churches we’ve been in touch with are coming to Festival One as a church camp, so they have a different code system and benefits. Check with your church’s ambassador what the details are, or if you’re not sure, feel free to email our team at info@festival.one and we’ll let you know what’s going on! We’re so excited to share the 2019 seminar sessions with you all. Starting from Friday 12th April we will release 2 seminars every week via Anchor. Big thanks to those that shoulder tapped us about the seminars since festival finished #REALMVP. Click here for the latest podcasts.